(Palgrave Macmillan, 2016) xv + 215 pp. Reviewed by Karen Bourrier on 2017-10-29. This book is one of the first texts in Palgrave Macmillan's new series in literary disability studies. It is also one of the first books devoted to disability studies and British Romanticism, which is surprising when one considers the wealth of material on this topic for scholars working in the late eighteenth and early nineteenth centuries. As Michael Bradshaw and Essaka Joshua note in their introduction, writers of the Romantic era have long aimed to highlight the disenfranchised and the marginalized, to reject idealized versions of nature, and to explore "the multiplicity of meanings of the human body and of alternative cognitive and mental states" (2). 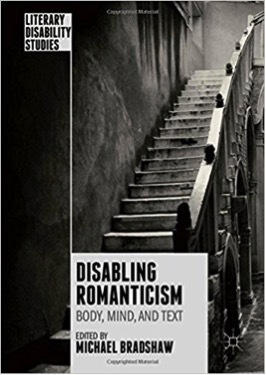 The Romantic era also plays a central part in the history of disability. Scholars have claimed that the Romantic era is an (uneven) transitional period between early modern constructions of the disabled as "prodigies" or "monstrosities" and the medical model of disability as personal defect that continues to inform our understanding of disability today. Scholars have also argued that disability is a product of industrialization and the rise of statistics in this historical period (11-13). Beside these historical features, which extend to the nineteenth century as a whole, disability may also be central to the aesthetics of the Romantic period. In one of the strongest essays in the volume, on picturesque aesthetics and deformity, Joshua surveys late eighteenth-century debates on whether "deformed people could be regarded as aesthetically pleasing" (30). While deformity--characterized by irregularity, asymmetry, sickness, and decay--was often faulted in the late eighteenth century, picturesque theorists including William Gilpin and Uvedale Price revalued roughness and irregularity as aesthetically pleasing. In doing so, they made an aesthetic place for the Romantic fragment and the ruin. A taste for irregularity could also extend, Joshua argues, to an appreciation for the deformed body, which was often elided with the ruined building in picturesque aesthetics. Joshua's insights thus prompt us to reconsider important figures in Romantic literature, from Wordsworth's leech-gatherer in "Resolution and Independence" to Mary Shelley's creature in Frankenstein. Arguably, a Romantic aesthetics of deformity both demonstrates the aesthetic appeal of such bodies and problematically objectifies them. Some of the strongest essays in this collection weave together literary criticism with historically informed biographical readings of disability. Heeding scholars such as David Mitchell and Sharon Snyder, who have stressed that biography can provide "an ethical and informed context for interpretation" in disability studies (qtd. Bradshaw 10), three contributors blend life writing and literary interpretation in essays on Mary Robinson, George Darley, and Lord Byron. Analyzing biographies of Byron from the nineteenth century to the present, for instance, Christine Kenyon Jones argues that his first biographers, including Leigh Hunt and Thomas Moore, largely created the myth that Byron's lameness directly led to his brooding and damaged personality, and with little thought, Jones contends, later biographers have recycled this myth to the present day. William D. Brewer examines Mary Robinson in light of the progressive paralysis that she experienced starting in her mid-twenties. Since Robinson had been a royal courtesan and actress before she became a writer, many of her contemporaries saw her disability as an occasion for mockery or as a punishment for her loose sexual morals (and indeed, it was rumored that her paralysis sprang from an infection after a miscarriage or an abortion, or from venereal disease). Others saw her disability as redemptive, with her immobility and her subsequent career as a writer atoning for her previous sins. But Brewer argues that Robinson herself adopted what we would now call a social constructionist model of disability, seeing her status as contingent upon her financial resources. As long as she could afford to maintain her social and artistic life, Robinson did not see herself as disabled. What disabled her was debt. In the final essay of the collection, Jeremy Davies investigates the stammer of the poet George Darley, a disability that previous critics have linked to his supposed artistic ineptitude. Davies weaves together a biographical account of the treatment that Darley underwent for his stammer with an analysis of his pastoral drama Sylvia; or, the May Queen. Far from being associated with poetic failure, Davies argues, Romantic stammering therapy, which often began with the recitation of poetry, did not merely serve to overcome an impediment but was also linked to artistic prowess. One of the challenges of disability studies has been figures of speech that make the absence of particular senses signify a lack of knowledge or intelligence, as in "he is blind / deaf to our concerns." As literary critics we cannot ignore these metaphors, but we also need to acknowledge how problematic they are. Matt Lorenz does so with sensitivity even while unpacking Blake's metaphoric use of blindness in The Four Zoas. David Chandler considers what Robert Southey does with the literal blindness and madness of George III in A Vision of Judgment. In Southey's poem, Chandler argues, the king's disabilities metaphorically represent the blindness and madness of a whole generation in the wake of the French revolution. According to Chandler, Southey's use of metaphor recuperates both the mad King's role in the popular imagination and the poetry itself, which has been critically dismissed. This volume does not shy away from including mental illness, addiction, cognitive impairment, and neurological difference within the frame of disability studies. Since most scholarship on the treatment of disability in nineteenth-century literature has focused thus far on the representation of physical impairment, casting a wider net is a welcome change. Corey Goergen, for instance, sets the frame of disability around Coleridge's addiction to opium. Contesting the longstanding verdicts that Coleridge's drug use was either a "crutch that enables his greatest imaginative verse" or an impairment that he "heroically transcends" or to which he "tragically succumbs," Goergen argues that Coleridge's body is "simultaneously real, socially situated, and metaphorically charged" (73). Turning from the disability of a poet to the disability of a character within a poem, Emily B. Stanback points to the protagonist of Wordsworth's "The Idiot Boy." Using this poem to launch a discussion of disability in Lyrical Ballads, she argues that while characters like Johnny Foy caused Wordsworth's readers distress, these characters also challenged them to experience "ethical growth, enabling them to become more open to the human diversity that has always existed around them" (65). Likewise, Julia Miele Rodas's essay on Frankenstein maps the distinctive features of autistic language, including "repetition, non-dialogic communication, expressive bursts, verbal pattern and order, and linguistic invention" onto Mary Shelley's novel (173). While Rodas's approach is anachronistic, as she readily admits, it yields some interesting results. There is much more material to be mined in future work on disability and Romanticism, perhaps particularly on the topic of mental health and literature. As Bradshaw and Joshua point out in their introduction, mental illness is a key point in some of the best-known biographies of Romantic writers, including writers not studied in this volume, from Thomas DeQuincey to Mary Lamb and John Clare. Nevertheless, the wide range of its essays show the importance of both physical and cognitive disability to British Romanticism. I hope this book will stimulate more sustained work on its topic, including monographs on Romanticism from the perspective of disability studies. Karen Bourrier is Assistant Professor of English at the University of Calgary, Canada. Leave a comment on Karen Bourrier 's review.